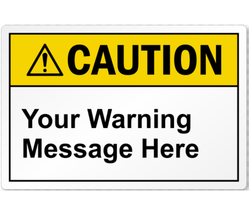 Our superior quality industrial labels, labels are used for product identification, advertising, name tags, warnings, etc. Further, these are offered in various designs, colours and patterns. These are long lasting, tamper proof, weather resistant and offer maximum usage. We customize the products to suit clients’ needs and charge competitive rates. We are involved in manufacturing and supplying printed polycarbonate stickers from fine technology and premium quality polycarbonate and acrylic papers. These labels are offered in various designs, patterns, sizes and are known for excellent thermal and physical properties to suit the requirements of diverse industries. 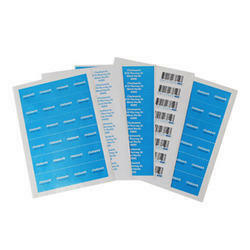 These sturdy and long lasting labels are used on different kinds of machines and these offer optimum usage to customers’. These could be simply maintained and re known for the best quality adhesive that make them useful to be used across various surfaces. We package the products in fine quality materials and are also able to custom made our range of labels as per clients’ needs. We are indulged in providing various sorts of excellent quality Paper Labels along with printing - stickers and tags, which are designed and printed as per clients’ preferences. These are developed with the help of top-notch technology and finest quality paper. Further, these products are offered in different designs, patterns, colors and these are used in handicrafts, textiles, sweet boxes, pharmaceutical and garment industry. We charge competitive rates. We have earned enough credibility in the market and we are famous as manufacturer and supplier of Inplant Labels. These labels are used for advertisements, handicrafts, textiles, etc. Further, these are being provided in different sizes, shapes, designs and colours. We charge industry leading rates. We are offering customers’ excellent quality Print Labels which are developed with the help of modern manufacturing facilities. These have features such as long service lives, rough handling resistance and tamper proof features. Further, we offer them in various designs, patterns, colours and sizes to our customers’. We charge reasonable rates. 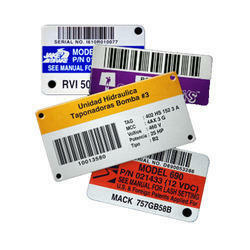 We manufacture different types of labels for various identification purposes. These labels are manufactured by using Paper Polyester Films, Aluminium Foils, etc. Adhesives in various combinations are available for different end uses while a variety of inks are being used to suit the needs of the applications. 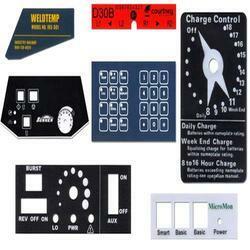 Die cutting and designing in various sizes are also possible. Also available are high tack adhesives for permanent bonding and adhesives that can withstand very high and very low temperatures too. 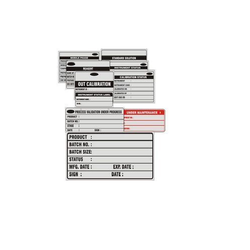 Our superior varieties of calibration labels are famous for their quality and are made from pvc/paper. These products are developed from fine technology and are known as write and protect labels. These thin and transparent adhesive films are offered in various sizes, shapes, designs and these are highly needed to protect the writing. 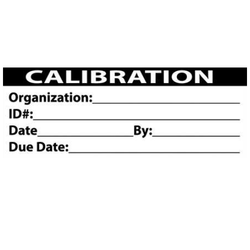 These are being offered at simple rates and are used for calibration in various industries. 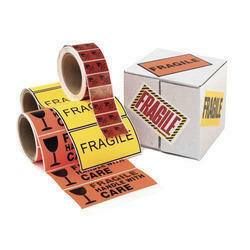 We are engaged in manufacturing and supplying wide varieties of Assets Tag and Labels. These are being made available in different designs, shapes, sizes and are used for verification and security. We develop them from the best available technology and these are highly ideal for laptops, PCs and furniture. These premium and high quality products are needed to bind permanently on the top of the pecking order of assets. These are highly preferred by customers’ and help in tracking and managing equipments. We customize the products to suit clients’ tastes and these are useful for easy and accurate asset verification. We charge competitive rates.